Roe & Co is a new premium Blended Irish Whiskey, named in honor of the 19th-century whiskey distiller George Roe, a true pioneer of Irish Whiskey. Roe ran Ireland’s largest distillery during Irish whiskey’s peak popularity in the mid-1800s. Refined, elegant, and with remarkable depth, a masterful blend of rich malt whiskey and the smoothest of grain whiskey aged in bourbon casks. The Roe & Co flavor was created by Diageo’s Master Blender, Caroline Martin, who has over 30 years of experience in her field, along with five hand-picked Dublin based bartenders, formed with the task of creating a unique blended, cocktail forward Irish whiskey. Martin tested over 100 different prototype blends before settling on Roe & Co’s current mixture. The hand-selected single grains and malts are matured exclusively in bourbon casks. Like most Irish whiskeys, Roe & Co is luxuriously smooth, even with 45% alcohol by volume (abv). The incredible depth of flavor is sure to intrigue and delight your palate. With a gentle, but lingering finish of slight creaminess, you’ll find it to be a sumptuous but sophisticated drink. 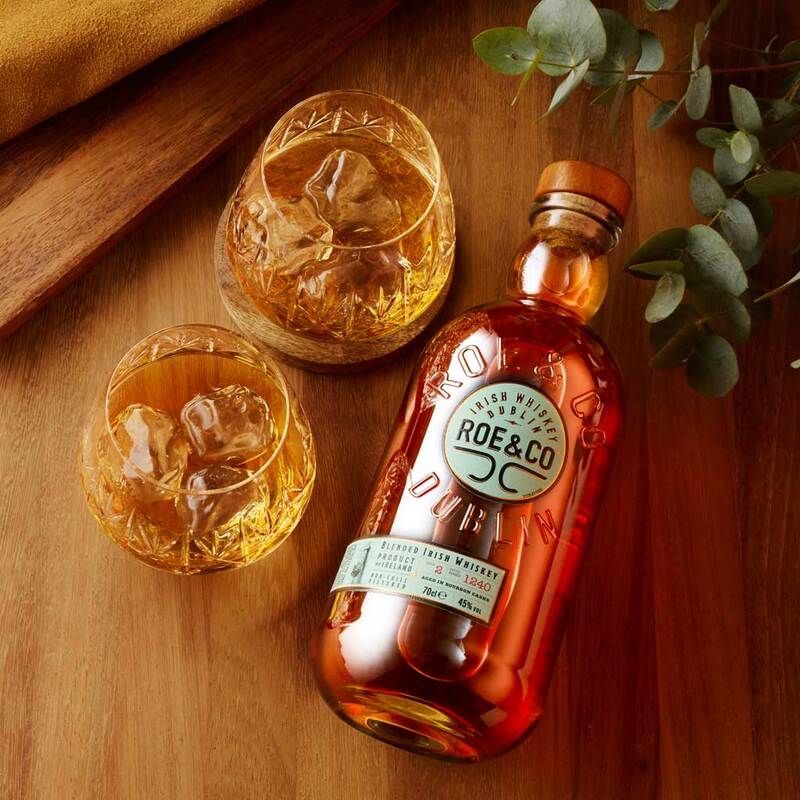 Roe & Co has already begun receiving accolades for their new brand, including a gold medal from Irish Whiskey Masters in 2018. While smooth and refined straight-up or on-the-rocks, Roe & Co also makes a delightful mixed creation. Roe & Co Cocktails are sophisticated and varied, like the Fancy Co Summer Spritz made with Roe & Co, pear liquor and champagne, served up in an champagne flute. Or the refreshing Roe & Red: Roe & Co, lemonade, a dash of bitters and a lemon garnish – all served in a highball glass over ice. Over the past decade, Irish whiskey has experienced an explosion in popularity. It is now the fastest growing spirit in the world, and it is anticipated that this growth will continue in the coming years. Producers expect not only to see the sales of quality crafted whiskeys expand but also increased interest in “whiskey tourism.” In 2007, there were only three active whiskey distilleries in Ireland. That number has since grown to about 30. Roe & Co will be a leader, driving the Irish whiskey market back to the peak popularity levels it saw nearly 200 years ago. The Irish whiskey trend is here to stay, and – lucky for you – Mancini Beverage now carries Roe & Co Irish whiskey for distribution to Rhode Island and Connecticut customers. Contact us today to add this smooth little number to your selection. Digital Marketing Solutions provided by Zero Gravity Marketing.